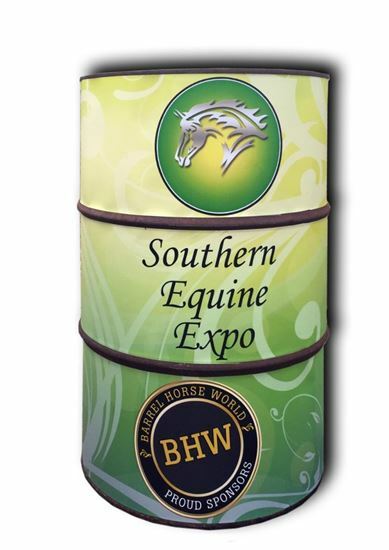 Our wraps for barrels are ideal for any barrel racing event. These wraps are 3-piece vinyl sections that are designed to fit between each chine on a barrel, secured by heavy-duty velcro at each end. Each set is unique and custom-designed to your specifications. Custom vinyl wraps for barrels are an excellent way to display your custom event with style and power. Upload your own print-ready file, or work with a member of our creative design team to produce the perfect promotion for your upcoming event. Our custom vinyl banners are manufactured using the highest quality 13oz scrim banner material and printed using premium level permanent inks to ensure your vinyl banner will remain vibrant and effective for years. Our wraps are made from a strong, UV protected, and nylon-reinforced material that is specifically designed to handle harsh weather conditions, making them perfect for indoor and outdoor applications. Here at ArenaBanners.com we are dedicated to your satisfaction and providing you an excellent product at the lowest price possible. All prices on our website already include the design, setup, printing and shipping costs, so there will be no surprises.If you have any issues or questions, please don’t hesitate to contact us. To preserve the life of your banner, always roll the wraps when storing, and try to avoid folding them. Clean with simple warm water. When storing this material, keep dry and at around 70°F. In the event your wraps get wrinkled, unfold and let stand in sunlight for a few hours.